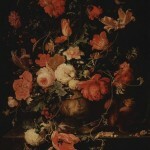 Abraham Mignon was a Dutch Golden Age painter who specialized in flower painting during the 1600s. He was born in Frankfort Germany in 1640 and at the age of 7 began his art education under Jacob Marrel (1613-1681), an established flower painter. 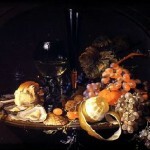 When Marrel moved to the Netherlands, 20 year old Mignon went with him and both became students of Davidszoon de Heem (1606-1684). 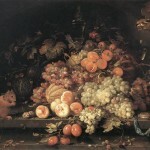 Mignon remained in the Netherlands until his death in 1679 and is considered a Dutch rather than German painter. 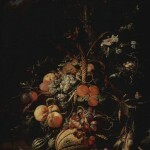 Abraham Mignon’s paintings are typically of flowers and fruit often on a dark background with a central white or red flower (often roses) or fruit in the center. Maria Sybilla Merian (1647-1717), Ernest Stuven (1660-1712) and Elias van den Broeck (1649/50-1708) studied under Abraham Mignon. 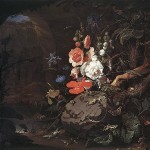 Mignon’s work was believed to have provided inspiration to John Van Huysum (1681-1749). 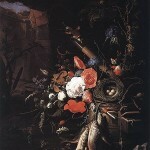 Louis XIV of France and the Elector of Saxony purchased paintings by Mignon.